For a while, we’ve been hearing that not all of Guardians of the Galaxy Vol. 2 takes place in space. New details courtesy of an extended skit on Jimmy Kimmel last night, however, have given us a few more details that might explain a few things as to why we’ll be heading to Earth in the new movie. In last night’s show, Kimmel sent his right-hand-man Guillermo to the set of the movie for a potential cameo role. The clip is mostly behind-the-scenes interactions with the cast of the show, but near the end—at around 6:06 in the video below—we do get to see a tiny little snippet of the movie. And it’s super weird. 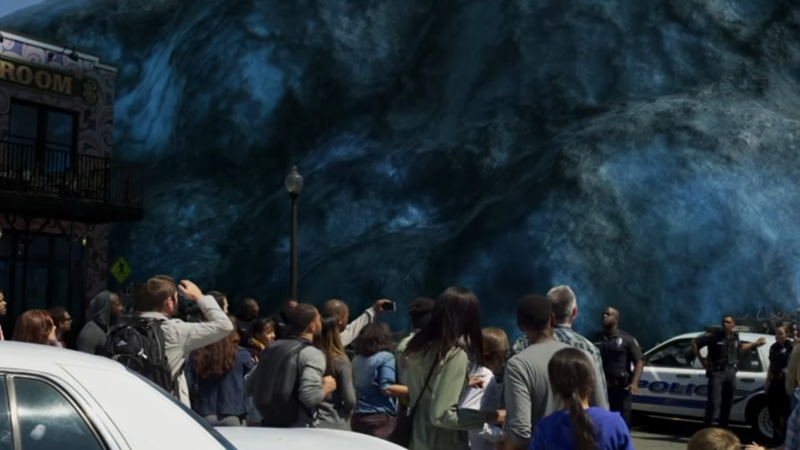 The brief clip shows a crowd of onlookers using their mobile phones (so it’s pretty clearly set on modern day Earth) to photograph a giant, blue blob of alien goop covering a busy town street. The goop suddenly glows bright, and starts engorging everything in its path, flipping cars and causing wanton, blob-based destruction. We’ve known for a while that the movie had at least a few Earth-set scenes: mainly because we’d seen set pictures of Nathan Fillion’s sneaky cameo as Simon Williams, a.k.a. comic superhero Wonder Man, on various movie posters at a theater. That, combined with the recent news that Ford would be getting one of its new cars into a scene for the movie as the “official vehicle” of the film, seemed to indicate a trip to Earth. But still, what the hell is going on here? The blob of goop seems like nothing we’ve seen from Guardians 2 so far. Is it part of the wider villainous plot, or is it potentially a piece of cosmic tomfoolery that could end up bringing the Guardians to Earth, just in time for Avengers: Infinity War? Whatever it is, it seems pretty far removed from everything else we know about the movie. Won’t be long until we find out what it really is, though—Guardians of the Galaxy Vol.2 hits theaters May 5.